Hi. We’re Juicer, and we have a social media marketing problem. The problem is: we want to do it, and we don’t know how. Feels good to get that out there. 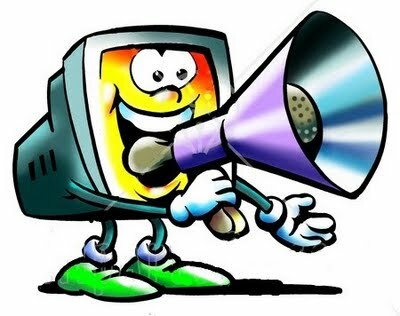 See this clipart with the computer screaming into a loudspeaker? Is this what social media marketing looks like? Who knows? Certainly not us. As the creators of a social media aggregator, we’re more than a little embarrassed by our lack of expertise in this area. We also recognize that any small business, no matter how social media savvy, had to start somewhere. For the foreseeable future, we’re going to document that “somewhere” on this blog. We’ll include research highlights (and lowlights), and show what’s working (and not working) as we implement a social media strategy. Stick with us and you might glean some insight for your own efforts, or at least some entertainment as we throw stuff and see what sticks. But before we start, we’d really like to hear your stories from the trenches. Whether related to your own business, or your work as a designated social media person at brand X, we’re interested. Did the posts from your earliest social media strategies take off, fall flat or completely crash and burn? What happened? Gory details welcome. Did you find social media marketing to be easier or harder than you expected? Is there anything you wish you’d better understood before you started? Inquiring minds want to know in the comments section. We’ll feature great comments in future blog posts.